They’re there for you when you need them most. Without having to ask, no matter where or when, whether you’re happy or sad, you can always count on them to be there. I’m talking of course about dogs. Without judgement or preconceived ideas about you, dogs make for some of the best company in the world. They are, after all, man’s best friend. Concordia student, Alexandra Sammons, 20, is repaying the favour a dog’s friendship provides. Not to her own dog, but to those that don’t have a home — dogs that live at the Society for the Prevention of Cruelty to Animals (SPCA). Currently in her first year at Concordia, studying in neuropsychology and working administratively part-time at engineering and construction group, SNC-Lavalin, Sammons spends what little time she has left volunteering at the SPCA as a dog walker and trainer. To become an official dog walker, it takes more than just a love of dogs. As simple a task as walking a dog may seem, the SPCA has standards and looks for someone who has more to offer than just love. Sammons explains that several steps must first be taken. After the initial application, the SPCA asks that you come in for an observation test run by team leaders — experienced trainers who work for the SPCA — who will then determine how compatible you are with the dogs. “The team leaders will walk dogs with you and two other people [that have applied] and they’ll observe you with the dogs, and have you walk yellow walkers to see how you react when they’re excited,” says Sammons. Something not everybody knows is that the dogs at the SPCA are divided into two different categories: silver walkers and yellow walkers. Silver walkers are easy to handle, well behaved dogs that can be trained and walked by all volunteers. The yellow walkers are more aggressive, scared, or excited dogs, that perhaps came from an abusive home and therefore require more experienced and trained walkers. As of now, there are approximately 150 dogs at the SPCA, and about 20 of those are yellow dogs. Out of the 150 volunteers, only about 10 of them are yellow walkers. 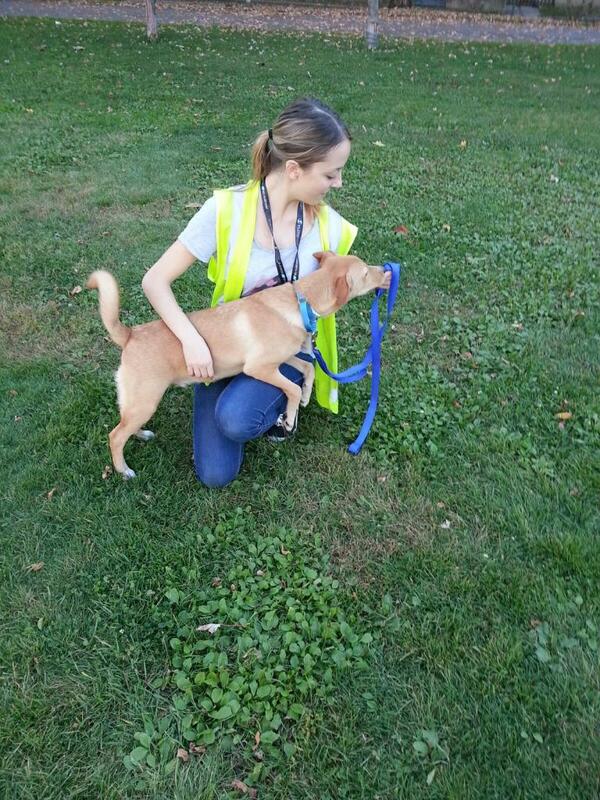 To become a yellow walker, volunteers must have been with the SPCA for at least one month and must attend a training session run by team leaders and yellow walkers to learn the rules and strategies used when taking yellow dogs out for a walk. Sammons, who has been volunteering at the SPCA for eight months, hopes to become a yellow walker within the next two weeks. She explains that while being a dog walker is very enjoyable it’s also physically challenging, especially if you are a yellow walker. “It’s very emotionally demanding, especially physically. You have to pretty much be fit. It’s as if you’re jogging for three hours, but you get used to it, and it’s great physical activity. The dogs are so excited, that they just want to run everywhere,” she said. During their shifts, volunteer dog walkers take as many dogs outside as they can at one time for either a 15 minute walk or 15 minutes of playtime in the backyard. “Walking dogs makes you feel like you’re doing something good. You really see that there’s a difference being made. What makes me stay is the fact that I notice that some dogs over the weeks have actually changed, you see that they notice you and remember you. You’re in a community of people who love animals as much as you,” said Sammons. Since dog walking is voluntary, the SPCA allows volunteers to make their own schedule as long as they do at least a three hour shift on the days they do come in. Since Sammons is a full-time student and works part-time, she volunteers once a week on Fridays, during the school year. With more and more dogs coming in each month, and dogs not always being adopted, the amount of walking to be done can be overwhelming, but with more volunteers the load can be managed fittingly. For those who have a passion for dogs and helping those in need, and have some spare time, Sammons strongly encourages you to sign up and volunteer. Sammons goes on to say that the SPCA isn’t a place to feel sadness and despair, it’s a place to help and motivate dogs to understand that there are people out there who care. At the moment, there are approximately 150 dogs, 400 cats and dozens of smaller animals such as rabbits, hamsters, and birds residing at the SPCA. If you or someone you know would like to become a dog walker or volunteer at the SPCA visit www.spca.com for information on how you can help.